These simple oven-fried drumsticks make a fabulous meal. Flour is seasoned with paprika and poultry seasoning, along with a little curry powder and salt and pepper. The chicken is coated with the seasoned flour and then baked to crispy perfection in a hot oven. 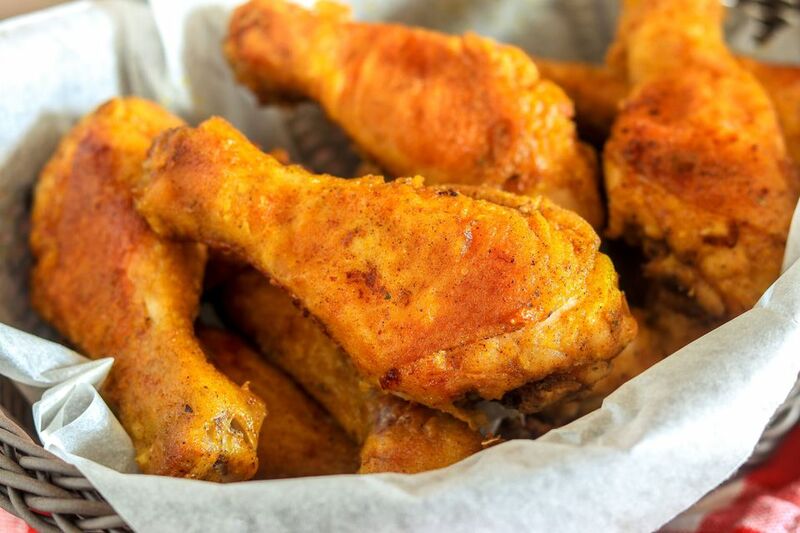 Bake these drumsticks for a tailgating event or a game day party at home. They're perfect for a picnic, too! The recipe is easily scaled up or down. Heat oven to 450 F (230 C/Gas 8). Line two 9-by-13-by-2-inch baking pans with heavy duty foil. In a food storage bag, combine flour, salt, pepper, paprika, curry powder, and poultry seasoning. Place 1/4 cup butter in each foil-lined pan. Place the pans in the oven to melt butter. Coat the chicken with seasoned flour mixture, shaking about three legs at a time in the bag. Place the chicken in the prepared pans in the melted butter. Bake the chicken legs in the preheated oven, uncovered, for 30 minutes. Turn the chicken over and bake 15 to 20 minutes longer, or until tender and nicely browned. According to the USDA, the safe minimum temperature for chicken is 165 F (74 C). Take these chicken legs along to a party or picnic. Serve them hot or cold. Give the chicken a little Cajun zing! Replace the curry powder and poultry seasoning with 2 1/2 teaspoons of Cajun seasoning. Reduce the salt to 1 teaspoon unless the seasoning is salt-free. Prepare the recipe with chicken thighs (on the bone) instead of drumsticks, or use a combination. Whole chicken legs are another excellent option.